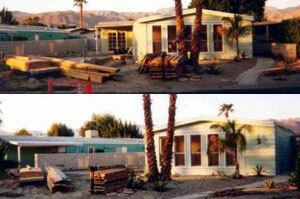 This is a before and after photo of a home completely remodeled by SAE Builders. During the course of this project all aspects of this home were improved. This project consisted of the following: redesign of front window treatment and entry, new windows and doors, installation of wood siding to front of home, insulated garage door, 30 yr. dimensional roof, new interior doors, new carpet and ceramic tile, gazebo w/ spa and landscaping. SAE Builders can provide you with many helpful ideas and methods of remodeling. The majority of our work is handled in house, which enables us to sustain a high level of craftsmanship. We do however have a select team of subcontractors simply to maintain a reasonable schedule and meet our customers needs. an exciting and pleasant experience. Before and during photos of a project in which we have added block walls, gates, detached garage and new hardboard siding. Please check back to see completed project. 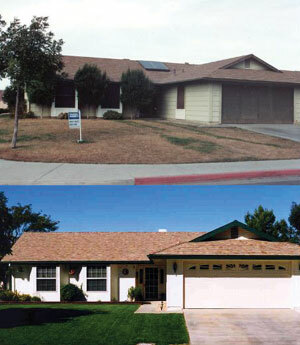 Cost effective alternative to buying a new home. Build and design to your own personal needs.